Common side effects include headache, feeling tired, dizziness, and dry mouth. Serious side effects may include an irregular heart beat. There is no evidence of harm in pregnancy, but it has not been well studied in this population. It should not be used with an MAO inhibitor. How it works is unclear. Cyclobenzaprine was approved for medical use in the United States in 1977. It is available as a generic medication. In the United States, the wholesale cost per dose is less than US$0.05 as of 2018. In 2016, it was the 46th most prescribed medication in the United States, with more than 16 million prescriptions. It was not available in the United Kingdom as of 2012. Cyclobenzaprine is used to treat muscle spasms, in conjunction with physical therapy, that occur because of acute musculoskeletal conditions . After sustaining an injury, painful muscle spasms may occur to stabilize the affected body part and prevent further damage. Cyclobenzaprine is used to treat such muscle spasms associated with acute, painful musculoskeletal conditions. It decreases pain in the first two weeks, peaking in the first few days, but has no proven benefit after two weeks. Since no benefit is proven beyond that, therapy should not be continued long-term. It is the best-studied muscle relaxer. It is not useful for spasticity due to neurologic conditions such as cerebral palsy. A 2004 review found benefit for fibromyalgia symptoms, with a reported number needed to treat of 4.8 (meaning that 1 person out of every 4.8 benefits from treatment) for pain reduction, but no change in fatigue or tender points. A 2009 Cochrane review found insufficient evidence to justify its use in myofascial pain syndrome. It may also be used along with other treatments for tetanus. Cyclobenzaprine results in increased rates of drowsiness (38%), dry mouth (24%), and dizziness (10%). Drowsiness and dry mouth appear to intensify with increasing dose. Dysphagia, a life-threatening side-effect, may rarely occur. The sedative effects of cyclobenzaprine are likely due to its antagonistic effect on histamine, serotonin, and muscarinic receptors. Agitation is a common side effect observed especially in the elderly. In general, the National Committee for Quality Assurance recommends avoiding the use of cyclobenzaprine in the elderly because of the potential for more severe side effects. Treatment protocols and support should follow the same as for any structurally related tricyclic, such as tricyclic antidepressants. Some experts believe that cyclobenzaprine should be avoided in elderly patients because it can cause confusion, delirium, and cognitive impairment. The most common effects of overdose are drowsiness and tachycardia. Rare but potentially critical complications are cardiac arrest, abnormal heart rhythms, severe low blood pressure, seizures, and neuroleptic malignant syndrome. Life-threatening overdose is rare, however, as the median lethal dose is about 338 milligrams/kilogram in mice and 425 mg/kg in rats. The potential harm is increased when central nervous system depressants and antidepressants are also used; deliberate overdose often includes alcohol among other drugs. 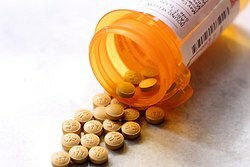 Monoamine oxidase inhibitors taken within two weeks of cyclobenzaprine may result in serious, life-threatening side effects. Cyclobenzaprine may affect the medications used in surgical sedation and some surgeons request that patients temporarily discontinue its use prior to surgery. The prescribing physician should be consulted prior to discontinuing, and resuming, cyclobenzaprine. Cyclobenzaprine has been found to be not inferior to tizanidine, orphenadrine, and carisoprodol in the treatment of acute lower back pain, although none have been proven to be effective for long-term use (beyond two weeks of treatment). No differences in pain or spasm scores were noted among these agents, nor when compared to benzodiazepines. However, nonbenzodiazepine (including cyclobenzaprine) treatment was found to have a lower risk of medication abuse and continuation of use against medical advice. Side effects such as sedation and ataxia are also less pronounced with nonbenzodiazepine antispasmodics. In a study on the treatment of musculoskeletal pain treatment with cyclobenzaprine alone or in combination with ibuprofen, no significant differences in pain scores were noted among the three treatment groups. Peak benefit was found to occur on day seven of the treatment for all groups. By mouth, cyclobenzaprine is marketed as Apo-Cyclobenzaprin, Fexmid, Flexeril and Novo-Cycloprine. It is available in generic form. A once-a-day, extended-release formulation, Amrix, is available. Cyclobenzaprine is also used by compounding pharmacies in topical creams. A rapidly absorbed form of cyclobenzaprine is being studied in the treatment for post-traumatic stress disorder. ^ Teva Pharmaceuticals USA, Inc (May 2016). "AMR40470 (Amrix) Prescribing Information" (PDF). ^ "Cyclobenzaprine Hydrochloride Tablets USP Revised: April 2005 Rx only". nih.gov. Retrieved 1 October 2016. ^ a b c d e f g h i j k "Cyclobenzaprine Monograph for Professionals". Drugs.com. AHFS. Retrieved 22 December 2018. ^ "Fibromyalgia, psychiatric comorbidity, and the somatosensory cortex | British Journal of Medical Practitioners". www.bjmp.org. 5 (2): a522. 2012. ^ Yang, Yul W.; Macdonald, James B.; Nelson, Steven A.; Sekulic, Aleksandar (December 2017). "Treatment of vismodegib-associated muscle cramps with cyclobenzaprine: A retrospective review". Journal of the American Academy of Dermatology. 77 (6): 1170–1172. doi:10.1016/j.jaad.2016.12.017. PMID 29132849. ^ a b c d e f "Flexeril (Cyclobenzaprine HCl) Tablets" (PDF). Food and Drug Administration. 2003. Retrieved 26 July 2009. ^ a b c Chou R, Peterson K, Helfand M (2004). "Comparative efficacy and safety of skeletal muscle relaxants for spasticity and musculoskeletal conditions: a systematic review". Journal of Pain and Symptom Management. 28 (2): 140–175. doi:10.1016/j.jpainsymman.2004.05.002. PMID 15276195. ^ van Tulder, MW; Touray, T; Furlan, AD; Solway, S; Bouter, LM (2003). Van Tulder, Maurits W, ed. "Muscle relaxants for non-specific low back pain". Cochrane Database of Systematic Reviews. 2 (1–2): 91–9. doi:10.1002/14651858.CD004252. PMID 12804507. ^ a b Browning R; Jackson JL; O’Malley PG (2001). "Cyclobenzaprine and back pain: a meta-analysis". Archives of Internal Medicine. 161 (13): 1613–1620. doi:10.1001/archinte.161.13.1613. PMID 11434793. ^ a b c "Cyclobenzaprine official FDA information, side effects, and uses". Drugs.com. October 2009. Retrieved 19 February 2010. ^ Ashby, P; Burke, D; Rao, S (1972). "Assessment of cyclobenzaprine in the treatment of spasticity". J Neurol Neurosurg Psychiatry. 35 (5): 599–605. doi:10.1136/jnnp.35.5.599. PMC 494138. PMID 4563483. ^ Tofferi JK, Jackson JL, O'Malley PG (15 February 2004). "Treatment of fibromyalgia with cyclobenzaprine: A meta-analysis". Arthritis Rheum. 51 (1): 9–13. doi:10.1002/art.20076. PMID 14872449. ^ Leite, FM; Atallah, AN; El Dib, R; Grossmann, E; Januzzi, E; Andriolo, RB; da Silva, EM (8 July 2009). "Cyclobenzaprine for the treatment of myofascial pain in adults". The Cochrane Database of Systematic Reviews (3): CD006830. doi:10.1002/14651858.CD006830.pub3. PMID 19588406. ^ Smith, Blaine T.; Smith, Visiting Professor University of Oklahoma College of Pharmacy Blaine T. (2014). Pharmacology for Nurses. Jones & Bartlett Publishers. p. 122. ISBN 9781449689407. ^ "Flexeril: Side effects". RxList.com. Archived from the original on 12 September 2008. Retrieved 22 February 2010. ^ "MEDICATIONS AND DYSPHAGIA/ SWALLOWING RISKS" (PDF). ^ "High risk medications" (PDF). National Committee for Quality Assurance. Archived from the original (PDF) on 1 February 2010. Retrieved 22 February 2010. ^ Chabria, Shiven B (17 July 2006). "Rhabdomyolysis: a manifestation of cyclobenzaprine toxicity". Journal of Occupational Medicine and Toxicology. 1 (1): 16. doi:10.1186/1745-6673-1-16. PMC 1540431. PMID 16846511. Archived from the original on 21 October 2006. ^ Keegan MT; Brown DR; Rabinstein AA (2006). "Serotonin syndrome from the interaction of cyclobenzaprine with other serotoninergic drugs". Anesthesia & Analgesia. 103 (6): 1466–8. doi:10.1213/01.ane.0000247699.81580.eb. PMID 17122225. ^ Medical Practice of William H. Gorman, M.D. (Feb 18, 2014). "Medications to Avoid, Continue, or Stop - Before & After Surgery". ^ Kobayashi, H; Hasegawa, Y; Ono, H (5 September 1996). "Cyclobenzaprine, a centrally acting muscle relaxant, acts on descending serotonergic systems". European Journal of Pharmacology. 311 (1): 29–35. doi:10.1016/0014-2999(96)00402-5. PMID 8884233. ^ Winchell, Gregory A.; King, Joyce D.; Chavez-Eng, Cynthia M.; Constanzer, Marvin L.; Korn, Scott H. (January 2002). "Cyclobenzaprine Pharmacokinetics, Including the Effects of Age, Gender, and Hepatic Insufficiency". The Journal of Clinical Pharmacology. 42 (1): 61–69. doi:10.1177/0091270002042001007. ^ "Medscape: Medscape Access". medscape.com. Retrieved 1 October 2016. ^ "Patient Web site for AMRIX® (Cyclobenzaprine Hydrochloride Extended‐Release Capsules)". amrix.com. Retrieved 1 October 2016. ^ "TNX-102 SL for Post-Traumatic Stress Disorder :: Tonix Pharmaceuticals Holding Corp. (TNXP)". www.tonixpharma.com. Retrieved 28 June 2016. Wikimedia Commons has media related to Cyclobenzaprine.